Basic training will vary depending upon the branch you enlist however it is vital to train and prepare yourself mentally and physically if you want to be successful and avoid injuries. While it is clear that these exercises will prepare you for basic training, there is one very important component that we must not leave out of your training, and that is endurance training. Depending on the branch of the military you are enlisting, you will be in boot camp from 7-12 weeks and can expect to be working physically daily. The best thing you can do is prepare your body to handle these activities daily. In addition, research into which branch you are enlisting, and know the skills for the job. Incorporate these activities into your weekly routine. If you are new at regular strength training and cardiovascular activities, ramp up carefully. Warm ups and cool downs (think brisk walk or jumping jacks) are a must, as are rest days. Give yourself at least 1 day of full rest per week and remember to alternate heavy training days with light training days. Remember: Form First! You will be timed in the military to see how many push ups you can perform in 2 minutes. Developing core strength, rotator cuff strength, and strength in the muscles that rotate your shoulder blades to support your shoulders should be a focus throughout your training. If you need help, look into rotator cuff strengthening and scapular stabilizing exercises. You may need to work up to sit-ups as well by starting first with core activation exercises. If you are new to core muscle training start here with these core stabilizing activities. 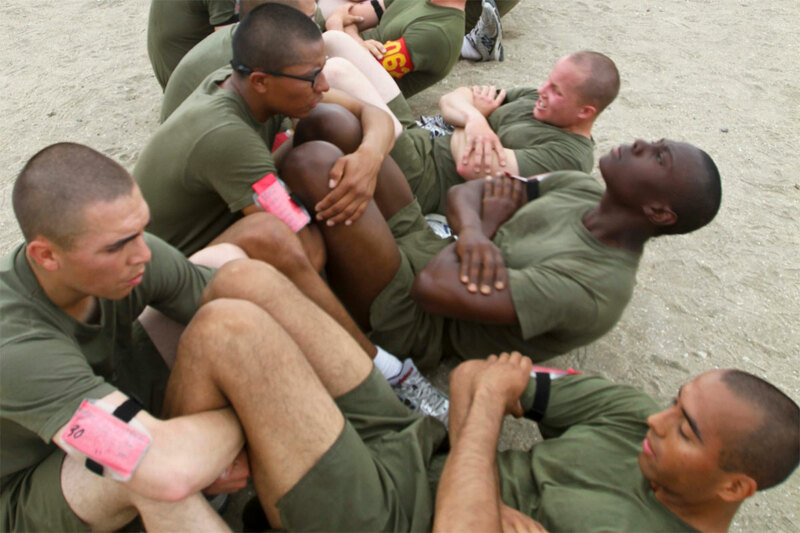 You should prepare to run 25-30 miles a week to avoid overuse injuries during basic training. This should be done progressively and you should incorporate cross training. If you are enlisting in the navy, alternate running days with swimming days. Know your limits: muscle soreness is expected, but joint pain is a sign of trouble. There are many training schedules out there to help you prepare/begin a running regimen. They offer a schedule set over a certain number of weeks and will give instruction for off days, cross training days, light days, heavy days, etc. Don’t ignore the aches and pains that you have before you even start. See your physical therapist, or find a physical therapist to rehab these problems first. Chances are, the physical therapist will pick up on strength and flexibility deficits that will further enhance your training abilities. Now get out there and train, train, train!